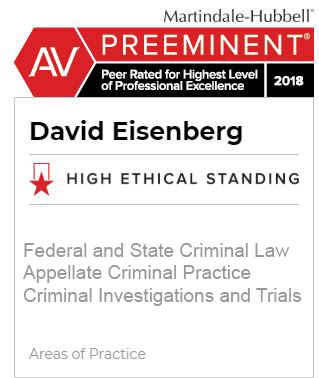 Attorney David Eisenberg focuses his criminal defense practice on state and federal criminal matters and appeals, with a particular concentration on white collar criminal defense matters. Based in Phoenix, he is well-positioned to assist clients in Maricopa County and throughout Arizona. For information about the full scope of his practice, visit the practice areas overview. Mr. Eisenberg has unique expertise in the investigation of defenses and the trial of complex white collar cases. Mr. Eisenberg has practiced law for nearly fifty years and has obtained Martindale-Hubbell’s highest Peer Review Rating of AV Preeminent. As a former federal prosecutor in Phoenix, New York and Washington D.C., Mr. Eisenberg has an in-depth understanding of the criminal justice system. He has tried cases in a wide range of state, federal, and appellate courts, including acting as Special Counsel or appearing before the grand jury. 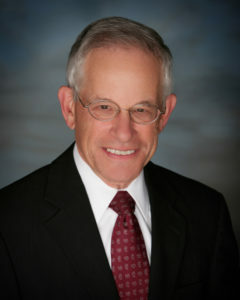 Mr. Eisenberg is also an arbitrator, appointed by the financial industry to arbitrate disputes between brokers and clients. As further testament to his standing in the legal field, he has taught courses on trial practice and white collar crime at Arizona State University. Mr. Eisenberg’s numerous professional honors include a Director’s Award from the Executive Office of U.S. Attorneys and Meritorious and Special Achievement Awards from the U.S. Department of Justice. Mr. Eisenberg was admitted to practice law in Arizona in 1996.